Pretty much no part of flying from New York to Los Angeles is fun, unless you're sipping champagne in first class. Take all the problems of flying -- the lack of space, the pressurized air, and the terrible people -- and then pile them on for six hours. It's like a doubleheader of awful. 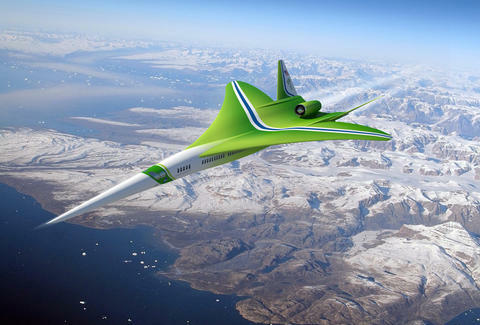 Well, the new N+2, a high-speed supersonic jet, would shave that doubleheader down into about the time of Mark Buehrle's perfect game, taking passengers from coast to coast in just over two hours. And it'll do all that without the sonic booms of other high-speed jets. Developed by Lockheed Martin and NASA, the long-bodied, 80-seater aircraft -- which looks more like a life-sized Ring Raider, minus the ring -- will travel distances of 5,000 nautical miles at a cruising speed of Mach 1.7. While it won’t fly quite as fast as the Concorde (which traveled at Mach 2, before it was retired), the N+2 will be 100 times quieter, with a reduced sonic boom that’ll be kinder to the environment and your ears, and enables it to fly over land. Powered by a system of three engines -- one on top of the aircraft and two tucked under the wings -- the plane will also make considerably less noise at takeoff, and it'll still be faster than similar jets in the works. Thing is, the N+2 won't be ready until 2025... so you'll have to wait a while to book. But based on the TSA lines at LAX, LaGuardia, and JFK, there's a chance that if you book now, you'll be through in time to see the N+2 launch.